It’s so interesting, the kids’ current routine of waking up at 5:30 am. Interesting like going to pick up the free tickets you’ve won for a weekend in New England only to find out you’ve won the Barry Manilow album, “Weekend in New England.” Col and Rose can be found at 5:30 am roasting silly putty at Col’s heater, gathered like two hobos to the warmth of a morning fire. Except this morning Rose reported that Col wouldn’t let her in his room because she was coughing on him. “I just don’t want to get sick,” explains Col, who touches every public surface as if he were reading braille. “Unngh,” one of us says from under the pillows we’ve piled on our heads. Did you ever hear the stories of birthing women who fall asleep between contractions? Well, it’s like that. Dan and I cling to each other under the covers, drifting into strange, broken sleep before someone is back in our room reporting the latest injustice like it’s Judge Wapner’s bedside court. Eventually they crawl into bed with us where Col practices his newfound massage skills. He’s really quite good, even if his diplomacy is lacking. “Is that your arm fat, Mama?” He asked me today. I finished the novel, State of Wonder, by Ann Patchett and now I want you all to read it. The writing is so crisp and original; Patchett can find 20 ways to explain how hot it is in Brazil without ever using the word “hot.” The story, if not entirely believable, is riveting and I’ve been mooning around all weekend missing the characters. Now I’m reading Simplicity Parenting (tagline: using the extraordinary power of less to raise calmer, happier and more secure kids) by Kim John Payne, which is not exactly riveting, but is illuminating. 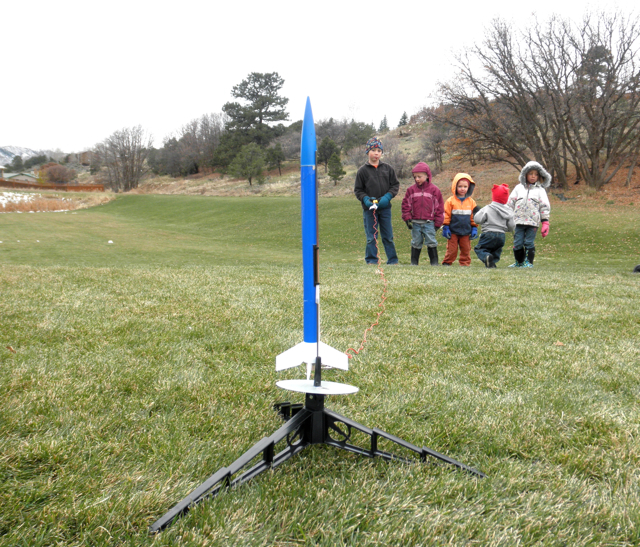 This weekend, on a finger-numbingly cold day we launched rockets in the park with my friend Melanie and her 3 sons. Rose was like, “do you think any other friends are going to show up?” (AKA: girls who love ponies) while Col and his buddy Mathew were simmering with enthusiasm. 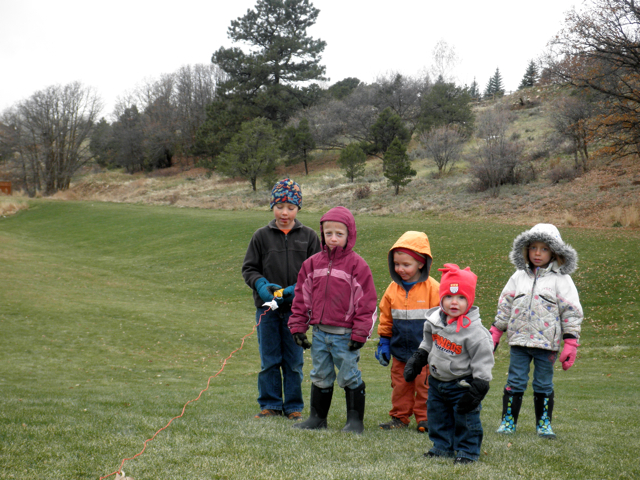 (Col is writing his own homeschool curriculum: Life Learning through Projectiles: rubber bands, rocks, sticks, arrows and for advanced study: rockets). Melanie is raising 3 boys and is wonderfully practical about it. Sometimes I’ll ask her how her day’s been and she’ll say with a sincere smile, “it’s been a day; but here we are,” which translates to something like: 1 boy was up 4 times last night, 2 of the 3 boys have been begging to nurse all day, someone got pinched or bit, and the lot of them have eaten a full loaf of bread and a pound of sliced turkey in the past 6 hours. I love this family so much. On the way home from the park Col asked “why don’t we have more brothers?” I explained that Dan and I thought 2 children was just the right number for us. 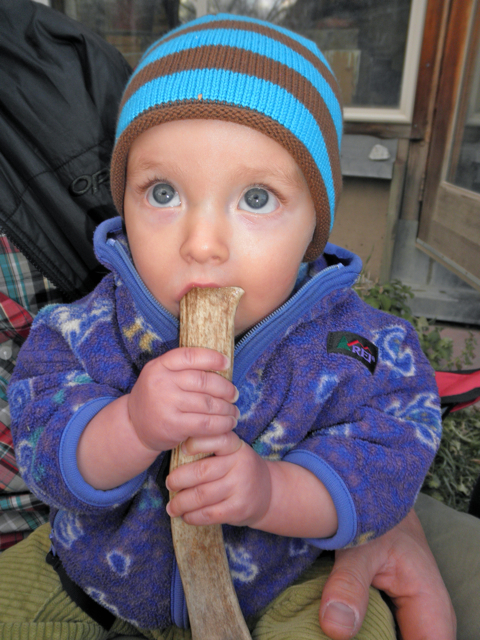 Warning: if you bring a baby to our house, we will not be held responsible for any antler-chewing habit that develops. Also, there was fire this weekend, which possibly trumps projectiles, at least until Col learns how to combine the two. And you? How was your weekend? 5:30. I don’t miss this. We’re past that point here…. my early riser now reads in bed and my baby (I know he’s five, he’s not a baby!) is a late sleeper. I used to put cheerios in lidded bowls and filled sippy cups in the fridge to fill their bellies so I did not have to leave the warm bed and uhm… snuggling. Hilarious. Those kids are so comical it must almost be worth the early rising. And good for Melanie and all you moms … staying so calm and good-natured. I need to get a life but really, you are SO awesome! Loved that. Our neighbors are having a party for their baby (3 months old).but it’s mostly grown adults attending .I’ll be glad when it’s over …the music ( it that’s what they are calling it) is so loud it’s driving me crazy…I’m sure the other neighbors will be glad when it’s over too..We were invited, I think out of politeness, or to keep us quiet about the noise, that’s my weeks end..
Just finished State of Wonder too. Best story I’ve read in a long time. The creation of baby stories are so awkwardly funny. I love them and I look forward to my turn. The snuggling bit cracked me up. I’m collecting all sorts of clever answers for when my own children start asking the awkward questions! My daughter was reading “Socks” by Beverly Cleary, when she got to the part about dad having the cat ‘fixed’ so she couldn’t have more babies. “Is that what you did Mommy so you wouldn’t have more babies?”. She’s outgrown the morning snuggle. Sometimes I miss it, but the mornings I find myself sleeping in? Not so much…. I love everything about this blog and your family. I have to chime in to whole heartedly agree with the two minutes of sleep between kid requests/complaints that feel like falling off a cliff into sheer oblivion. Also, I was one of those sleep between contractions kind of ladies. I just sort of turned off in between. Also, if you don’t have a stomprocket you should. It involves a nerf-like rocket put over a plastic tube that is connected to an air sac. You put the rocket on, stomp on the air sac and watch the rocket fly. As you know we have three girls and they are *not* ho-hum about the stomprocket. It’s really simple and makes a very satisfying “phwomp” sound when it launches. ps. Echo almost daily asks me to just grab my i.u.d and pull it out. I so enjoy your blog. Your writing is beautiful! I look forward to reading it each week and gaining parenting, gardening, cooking and general homesteading inspiration. 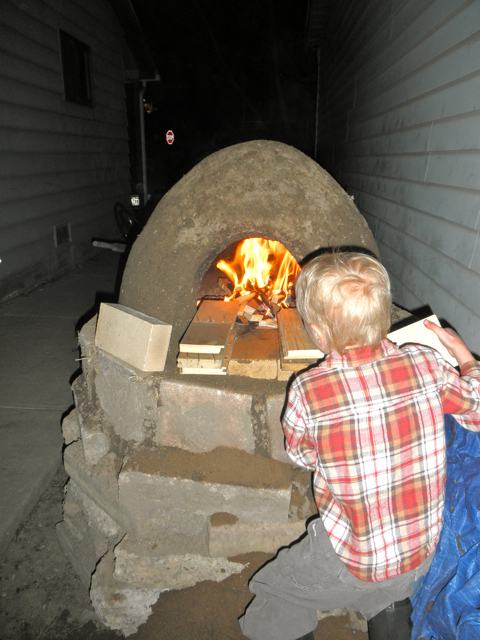 I’m particularly struck by the wood fired oven and wonder if you could speak about that process a bit more – although I think you said your housemates built it. 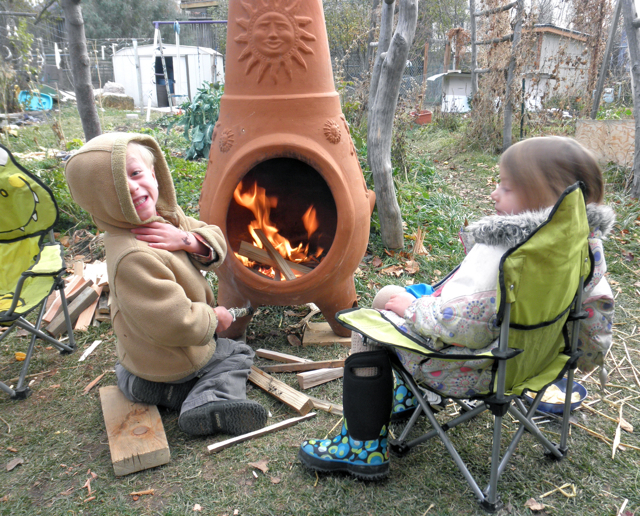 We’ve talked about building one (cheaply) in our tiny backyard but haven’t found the resources to start yet. bless quinn and his ability to sleep in. :) laughing hysterically at women who sleep through contractions. “Did you ever hear the stories of birthing women who fall asleep between contractions?” – yeah, that was me. I love your humor. I love your writing. I love your family. I’m just sayin’ (for the gazillionth time now, I know). Hey there! I’ve been following your blog for a long time now and finally got the courage to go ahead and give you a shout out from Austin Texas! Just wanted to mention keep up the great work!